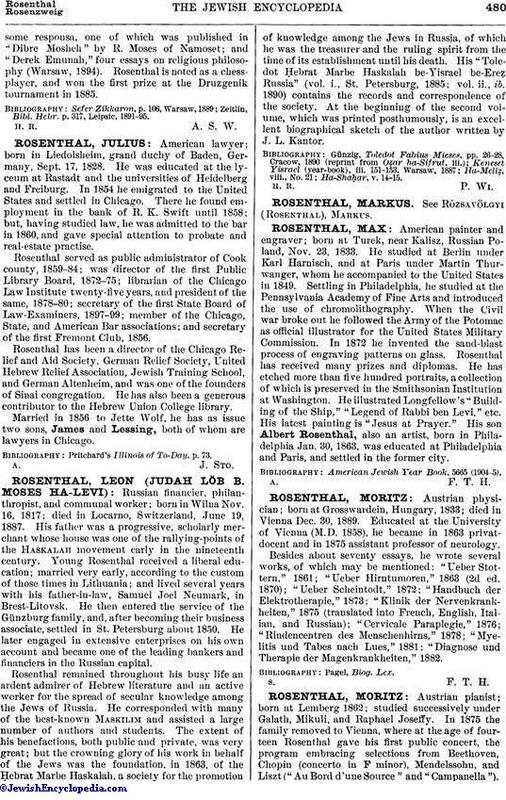 Austrian physician; born at Grosswardein, Hungary, 1833; died in Vienna Dec. 30, 1889. Educated at the University of Vienna (M.D. 1858), he became in 1863 privatdocent and in 1875 assistant professor of neurology. Besides about seventy essays, he wrote several works, of which may be mentioned: "Ueber Stottern," 1861; "Ueber Hirntumoren," 1863 (2d ed. 1870); "Ueber Scheintodt," 1872; "Handbuch der Elektrotherapie," 1873; "Klinik der Nervenkrankheiten," 1875 (translated into French, English, Italian, and Russian); "Cervicale Paraplegie," 1876; "Rindencentren des Menschenhirns," 1878; "Myelitis und Tabes nach Lues," 1881; "Diagnose und Therapie der Magenkrankheiten," 1882.